A blessed feast of Our Lady’s Nativity to you! Nine months ago today, on December 8th, we celebrated the Immaculate Conception of Our Lady in the womb of Saint Anne. Today we celebrate the birth of this Vessel of Honor, so wonderfully prepared by God to become the Mother of the Divine Savior — She whose Immaculate Heart, in the first hour of Her life, brought more glory to God than all the Angels and Saints of all time. It is said of Mary in Ecclesiasticus, “My abode is in the full assembly of saints” (24:16); that is, that She holds in plenitude all that other saints have held in part. For from Her mother’s womb, even before Her birth, the Blessed Virgin surpassed in sanctity all saints and angels. The grace that the Blessed Virgin received in the first instant of Her Immaculate Conception exceeded not only that of each particular saint, but of all the angels and saints put together, for Mary was chosen by God to be the Mother of the divine Word. And indeed it cannot be doubted that when the Person of the Eternal Word was, in the divine decrees, predestined to make Himself Man, a Mother was also destined for Him, from whom He was to take His human nature; and this Mother was our infant Mary. St. Thomas teaches that God gives everyone grace proportioned to the dignity for which He destines him. (S.T. III, Q. 27, A. 5) And St. Paul teaches us the same thing when he says, “Who also hath made us fit ministers of the New Testament” (2 Cor. 3:6); that is, the Apostles received gifts from God proportioned to the greatness of the office with which they were charged. It is an axiom in theology that when a person is chosen by God for any state, he receives not only the dispositions necessary for it, but even the gifts which he needs to sustain that state with decorum. But as Mary was chosen to be the Mother of God, it was quite becoming that God should adorn Her, in the first moment of Her existence, with an immense grace, and one of a superior order to that of all other men and angels, since it had to correspond to the immense and most high dignity to which God exalted Her. And therefore all theologians come to this conclusion that since the Blessed Virgin was chosen to be the Mother of God, it is not to be doubted that God fitted Her for it by His grace, so much so that Mary, before becoming Mother of God, was adorned with a sanctity so perfect that it rendered Her fit for this great dignity. As the light of the sun so greatly surpasses that of the stars, so that in it they are no longer visible, being overwhelmed to such a degree that it is as if they were not; so does the great Virgin Mother surpass in sanctity the whole court of Heaven. Let us consider also the greatness of the fidelity with which Mary immediately corresponded to divine grace. The holy child, when She received sanctifying grace in the womb of St. Anne, received also the perfect use of Her reason, and was also divinely enlightened in a degree corresponding to the grace with which She was enriched. Thus from the first moment that Her beautiful soul was united to Her most pure body, She, by the light She had received from the wisdom of God, knew well the eternal truths, the beauty of virtue, and above all, the infinite goodness of God, and how much He deserved to be loved by all, and particularly by Herself, on account of the singular gifts with which He had adorned and distinguished Her above all creatures by preserving Her from the stain of Original Sin, and by bestowing on Her such immense grace. Hence, from that first moment, Mary, being filled with gratitude to God, began to do all that She could do, by immediately and faithfully trafficking with that great capital of grace which had been bestowed upon Her; and applying Herself entirely to please and love the divine goodness. From that moment She loved Him with all Her strength, and continued thus to love Him always, during the whole of the nine months preceding Her birth, during which She never ceased for a moment to unite Herself more and more closely with God by fervent acts of love. She was already free from Original Sin, and hence was exempt from every earthly affection, from every irregular movement, from every distraction, from every opposition on the part of the senses, which could in any way have hindered Her from always advancing more and more in divine love. Her senses also concurred with Her blessed spirit in tending towards God; hence Her beautiful soul, free from every impediment, never lingered, but always flew towards God, always loved Him, and always increased in love towards Him. 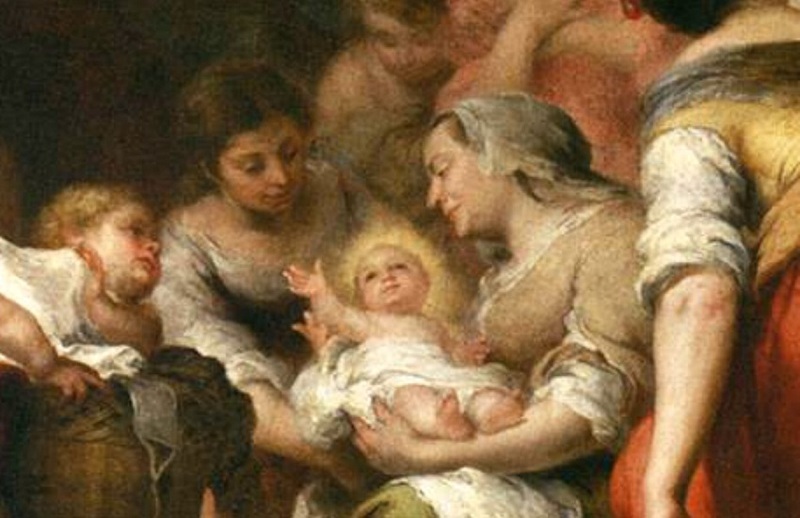 Let us, then, rejoice with our beloved infant, who was born so holy, so dear to God, and so full of grace. And let us rejoice, not only on Her account, but also on our own; for She came into the world full of grace, not only for Her own glory, but also for our good. St. Thomas remarks that some saints have so much grace that it is not only sufficient for themselves, but also for the salvation of many, though not for all men: only to Jesus Christ and to Mary was such a grace given as sufficed to save all: “should anyone have as much as would suffice for the salvation of all, this would be the greatest: and this was in Christ and in the Blessed Virgin.” (Exp. In Sal. Ang.) St. Thomas of Villanova calls Mary “full of grace, of whose plenitude all receive”; so much so that St. Anselm says, “that there is no one who does not partake of the grace of Mary.” And who is there in the world to whom Mary is not benign, and does not dispense some mercy?